Jimmy Floyd Hasselbaink swept into the Grosvenor Casinos 1897 Suite at Sixfields a full 90 minutes after his scheduled arrival on Tuesday afternoon. But any irritation amongst the waiting media pack was quickly soothed, as the former Chelsea and Leeds United striker strode confidently into the room, flashed a wide smile and an issued immediate apology for his lateness. He then asked for somebody to take a picture of him in front of the Cobblers’ advertising backdrop ‘so I can show my wife’, and immediately the mood was relaxed. Sometimes these press conferences when, in effect, new managers are expected to share their innermost thoughts and plans with total strangers, can be slightly uncomfortable affairs, but not this time. Hasselbaink was charming, engaging, open, and willing to talk at length about his hopes and the challenges facing him at the Cobblers. He can even be forgiven for that late arrival at Sixfields, as he had come straight from taking his new Town squad for their first training session at Moulton College. And that, after all, is the really important part of his new job, a job he can’t wait to get stuck into after 10 months out of work. Following a successful year in charge at Burton Albion, a productive spell that saw him win the league two title and then steer the Brewers to the top of league one, Hasselbaink’s coaching career suffered its first misstep as he was sacked by Queens Park Rangers after less than a year in charge. The 45-year-old admits he has been striving to get back into work since his departure from Loftus Road, but wanted to find ‘the right project’. And he believes he has now done just that. “I was very eager to get back, “ said Hasselbaink. “But I was only eager for the right opportunity, for the right project, and I think this is the right project for me. 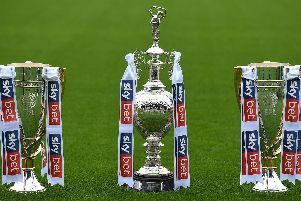 The Cobblers are clearly a few steps down the footballing pecking order from QPR, but there are similarities between them and Burton, who are now enjoying their second season as a Sky Bet Championship club. Indeed, Hasselbaink believes there is more potential at Sixfields. “The clubs are not dissimilar, but with all due respect this is a bigger club than Burton,” said the former Netherlands international. “We have more supporters, and we are a little bit further than Burton were when I took over, and they are now in the Championship. So does he feel he can repeat the success he enjoyed at the Pirelli Stadium in his new job? “I think you have to respect every job differently. Burton was a different job, and this is a different one again,” said Hasselbaink. “There are different kinds of individuals, and we have to adapt, we have to be flexible, and we have to find the strongest way forward for this group. So, after one training session, what are the new Cobblers manager’s initial thoughts on the squad of players at his disposal? Hasselbaink admits he likes what he sees, but says being a successful player is about more than ability. It’s about hard graft, and he will be drilling that into the Town players. “There are talents in the squad,” said the two-time Premier League Golden Boot winner. “I think we have a lot of talent, and that is what I have said to the playing squad as well. “But talent means nothing if you don’t have the dedication and hard work. One issue that Hasselbaink has to face is, that with the transfer window closed, he is pretty much stuck with the squad he has inherited. But he is relaxed about that.